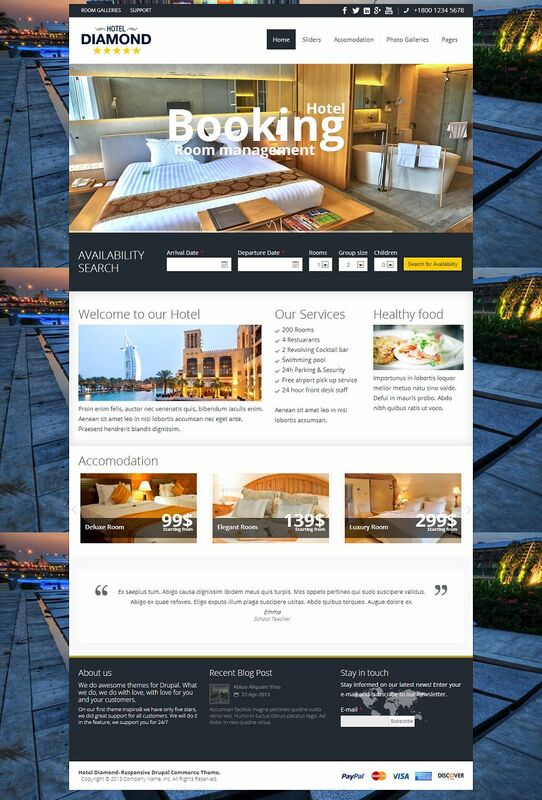 Hotel Diamond is a responsive Drupal theme for hotels, vacation rentals, bed and breakfast, service apartments or any other kind of accommodation which requires a booking system. This theme comes integrated with Commerce to manage payments, Paypal, Visa, MasterCard…, Tax calculation/VAT, Discount pricing and much more. Create rooms and assign availability (or on hold states) via a calendar. Manage pricing for rooms using calendars that allow to set pricing for entire seasons or just change it for specific dates. Charge either per-night or per-person. Create bookings and keep customer records. Make rooms available for booking with a availability search functionality and/or calendar – handling both immediate bookings and bookings following owner confirmation. Full integration with Commerce to manage payments, a range of different payment gateways, and a host of other e-commerce features. Accept full or partial payments (deposits) using Commerce features.